Write a scene that revolves around food. a favorite or traditional food in your family. a dinner date that went seriously pear-shaped. Don’t forget to detail the food as well as the conversation. the dynamics that expand like impending storm clouds whenever extended family gathers for the holiday feast. Don’t forget to include the uncle who likes the little girls to sit on his lap and the mother-in-law who drinks to excess. Your piece, of course, will be entirely fiction. As I prepare for Thanksgiving, an American holiday that centers on cooking, baking, eating to excess, and then complaining about how full you feel, I bring out the tried and true recipes as well as some new. Using the family’s favorite recipes is crucial. I remember one gathering of vegetarian friends. The host would supply the nut loaf and the drinks; the guests would bring vegetarian side dishes in keeping with the season. The buffet was to die for- gorgeous dish after gorgeous dish. But just as we were about to give thanks, someone complained, “But where are the mashed potatoes and gravy!” At which point, dinner came to an abrupt stop. Someone went out for potatoes. Another person went out for gravy. In keeping with American tradition, we are serving turkey for Thanksgiving. 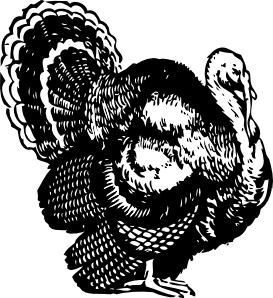 My turkey will be basic – woodsman style. I’ve become a minimalist. My sister-in-law is going upscale with a grilled, Mexican spice-rubbed turkey with mole sauce. Her recipe will call for significantly more kitchen time. My recipe is an old one. It came from an acquaintance who was shot dead by an ex-girlfriend (or wife) when she found him in bed with another woman. That in itself should recommend this recipe for Wild Turkey. Dig a hole 18 inches deep and prepare a large bed of charcoal. When the charcoal is white hot, remove half of the coals and put the turkey (wrapped in cheesecloth and foil) on top of the coals. Next, replace the coals you took out, cover the hole with a piece of metal, and cover the metal with dirt. Bury the turkey one hour for every two pounds. I’ll let you know how it turns out. Looking for new recipes for side dishes, I consulted a number of cookbooks to include Reflections, published some twenty years ago by the Custer County Woman’s Club. The book is part local history and part recipes. Well, the wild turkey recipe sounds like my recipe for pit-firing clay pots – they turn a wonderful black. I look forward to hearing what happens to the turkey! As for the other recipe from 1890, I love the image. I’d like to find out what the turkey makes of the procedure… It certainly won’t go cold turkey, for sure. Have a good Thanksgiving!